Many factors will determine how our property markets start off this year. 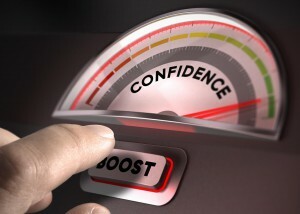 But one of the big ones will be consumer confidence and the latest news is good. Of course when we feel confident we’re more likely to make big financial commitments like moving home or buying an investment property. And when confidence wains, the opposite is true. And of course, a rebound in consumer spending is important for general economic growth. So the latest ANZ-Roy Morgan Australian Consumer Confidence Index is good news as it jumped a sharp 5.9% to 120.1 this week, more than reversing the decline in the last survey conducted in mid-December (post the surprisingly weak GDP reading). The headline index is now at its highest level in 15 weeks. The details were broadly upbeat, with views on ‘economic conditions over the next 12 months’ and ‘now is a good time to buy a household item’ leading the gains. Households’ views of economic conditions over the next 12 months bounced a solid 11.2%, almost entirely reversing last month’s decline. Household views of the economic outlook in the next five years rose 2.2%. Households’ views towards their finances compared to a year ago rose 3.0% and now sits at the highest level since the end of September 2016, when the index reached a post-GFC high. Households’ views towards their future finances also improved, up 3.5% last week, and are in a strong upward trend. Household views on whether ‘now is a good time to buy a household item’ bounced a solid 10.1%, more than reversing last month’s decline. 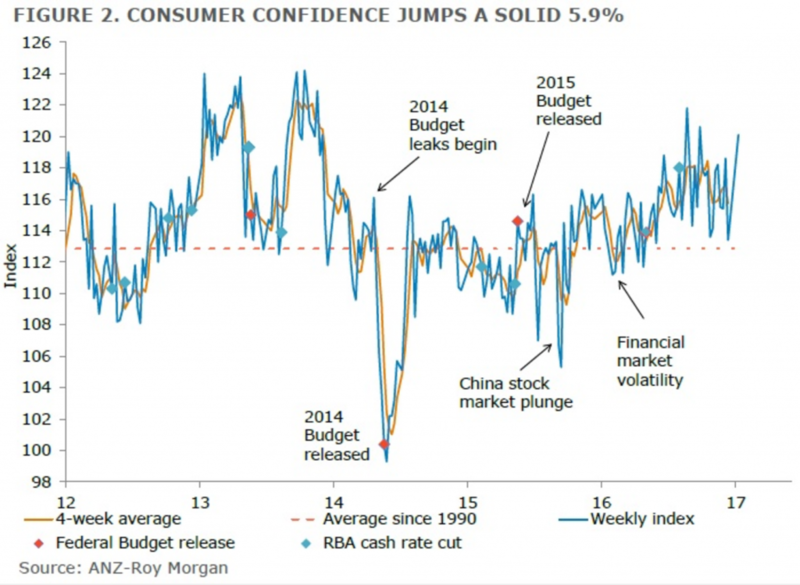 “Last week’s solid rebound in ANZ-Roy Morgan Australian Consumer Confidence – after the post-GDP plunge – suggests an upbeat start to 2017 for households. While consumers tend to be more optimistic in January, likely due to the holiday season, it is a positive sign for the economy that households are particularly upbeat about their current financial situation. This index is a reasonable indicator of consumer spending, suggesting a solid Christmas and holiday spending period is underway.